This week saw consolidation of our tunes in the classes and the FluteFling classes started looking at a couple of new tunes to work on over the next three weeks. See below for news on the scheduled break and classes. FluteFling Beginners: At last night’s class we consolidated The Skye Boat Song, had a look at the first part of The Arran Boat Song and all of Tha Mi Sgith. Tha Mi Sgith (pronounced “hah mee skee”) is a Gaelic lullaby which translates as I am Tired. In the song the mother describes being tired due to pulling bracken or ferns from the hillside for use on the farm and the strathspey which derives from this melody is often called Cutting Ferns or Cutting Bracken. I talk about it further in an entry from last year and also in this entry. Please note that the links to resources have recently changed and may not work on older pages. Instead, all resources can be found on this one handy page on The Flow web site. Please note that I have updated the notation for this tune and added a harmony part. We also looked a little at the single grace note from below, played on the whistle by sliding the finger and gradually uncovering the hole below the note. We used this on The Arran Boat Song to decorate E and B.
SMG whistle: we consolidated The Skye Boat Song and The Arran Boat Song and revisited I See Mull. Finally, I am aiming to get all of the classes together for an afternoon one weekend towards the end of November, date and venue yet to be determined. 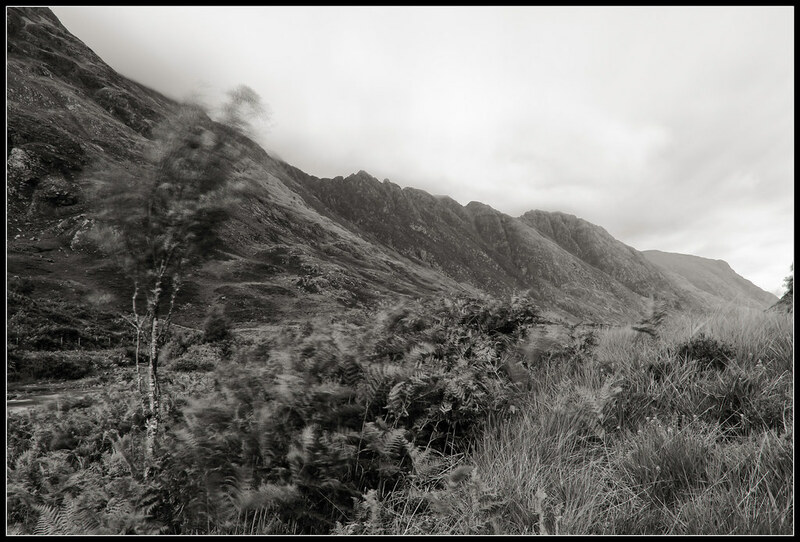 Photo: Blurry Tree and Ferns, Glencoe by Tim Haynes, some rights reserved. This entry was posted in classes, FluteFling, Resources, Scots Music Group, The Flow and tagged beginner, classes, community, edinburgh, flute, improver, MP3, portobello, Scots, Scots Music Group, strathspey, tin whistle, traditional music. Bookmark the permalink.